The eSquared Asphalt Maintenance experts work tirelessly to deliver professional services that don’t strain your budget. Our technicians will work with you to provide the best workmanship possible and discuss all possible options and outcomes. Whether you’re looking for parking lot maintenance in Corsicana, TX, or you want your back patio restored, our professionals have you covered. Contact us at 254-716-8685 to schedule your evaluation. Our service providers are trained and up to date on all local and state codes and guidelines to ensure compliant concrete striping in Corsicana, TX. We offer advice on material and product options like cost, performance, and lifespan, and deliver expert painting that’s smooth and flawless. Our team is knowledgeable in all EPA and ADA codes and guidelines to make sure that your project is always finished within compliance. Handicap Striping Our professionals provide comprehensive, handicap striping to make sure you are ADA code compliant. Handicap Logo Painting If your logos are starting to peel and crack, contact our experts to repaint them accurately to prevent code violations. Road Striping Our experts are experienced in types of road striping, from temporary construction lining to permanent road lining. 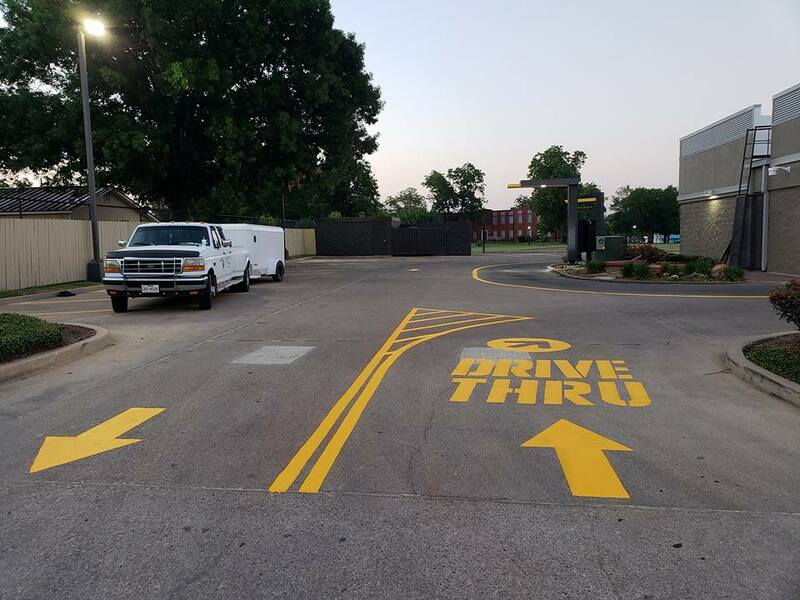 Warehouse Striping Improve the look and safety of your space by striping forklift and pedestrian lanes, loading areas, and more. Reflective Parking Lot Paint Find out what makes reflective paint special and whether it’s the right material for your project. Our professionals can provide pressure washing completion for all of your residential or commercial structures including breakable materials like wood and vinylwithout leaving marks or spray patterns. Our professionals can remove all dirt, algae, paint, and even mildew without damaging the sensitive layers underneath. We can restore and revitalize your wood and vinyl constructs, eliminating mildew and mold, and maximizing its longevity and durability. Call 254-716-8685 when you need a trained, professional team you can trust with your commercial or residential pressure washing in Corsicana, TX. Code Compliant Pressure Washing Don’t be non-compliant because of a negligent pressure washing team. Our experts recognize and follow all EPA guidelines. Mold, Mildew, and Dirt Removal Find out how our technicians can remove algae, mold, and mildew from your siding, wood, and exterior surfaces for good. Restaurant Pressure Washing No matter if it’s kitchen, oven, or vent cleaning, our technicians can completely remove all grease, dirt, and gunk buildup. Concrete Stain and Gum Removal Keep your parking lot safe and inviting with our stain, gum, and grease build up removal system. Our expert technicians can provide expert installation, repair, and restoration of concrete constructs like driveways, walkways, and columns. Our professional concrete technicians can design almost any look and texture by utilizing artistic touches like hand decoration, stamping, and overlays to create a perfectly customized look for your project. The eSquared Asphalt Maintenance cleaning and protective concrete services provide your constructs with resistance to UV rays, weather, and water that can cause premature degradation. Call the eSquared Asphalt Maintenance professionals when you need concrete services in Corsicana, TX that you can be proud of. Concrete Walkway Installation Prevent erosion and flooding while creating customized style with a new walkway. Concrete Bordering and Curbing Eliminate washout and sagging borders- our team can create customized concrete borders in any shape and style. Specialty & Decorative Concrete Company Discover how our team can use specialty techniques to create a completely one of a kind look for your home. Concrete Waterproofing Service Our professional can shield your concrete from water that leads to irreversible damage to your concrete with our waterproofing services. At eSquared Asphalt Maintenance we are able to offer other services for our clients besides concrete lining, concrete installation, and pressure washing. While we are known for providing a wide range of services for concrete and asphalt surfaces and structures, we also offer services like gutter cleaning, window washing, and construction clean up. To schedule an appointment for any of these service, feel free to call our office at 254-716-8685. We are here to help when our clients need additional services and concrete striping in Corsicana, TX. Construction Site Clean Up Our construction site clean up is reliable and effective, getting rid of any unwanted material or trash you need. Roof Gutter Clean Out Service Do your gutters need professional cleaning? You can rely on our contractors for roof gutter cleaning services. Window Washing Service When you need window washing service for your home or business, contact our team! Our technicians work tirelessly to cultivate relationships with the top area suppliers to ensure your materials are always high quality, and we provide top rated workmanship that’s sure to satisfy. 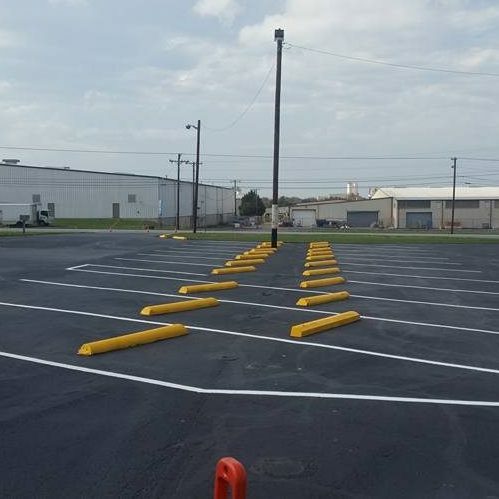 Our trained experts can complete any concrete or asphalt project your home or business needs, including experienced parking lot maintenance, throughout Corsicana, TX. When you’re looking for certified concrete professionals you can count on, contact the eSquared Asphalt Maintenance team at 254-716-8685 and set up your consultation today.